My whole family likes it and eat it happily when I cook it. It is very expensive to afford in bazar but I make it at home in only 70 Rs(4 serves) whereas in bazar a single plate is of Rs 100. It is very refreshing. It Can be eaten in aftari or before meals. 1. First boil the chicken, chopped potatoe, and chopped carrot. 2. Now add cream, yogurt, mayonnaise, salt, pepper and sugar in a bowl and mix well. 3. Add the boiled ingredients and all fruits to the mixture. 5. 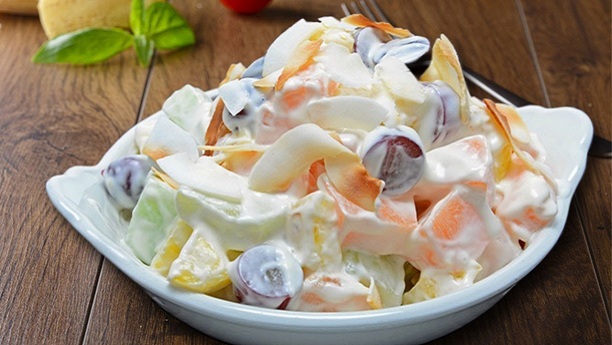 Tasteful and refreshing creamy Russian salad is ready.